Having a family member who is older or has a disability and requires help during the day is challenging. It can be hard to piece together enough help from other members to get through the daytime hours. Finding someone who can be there overnight may be impossible with work and family commitments. Even if someone is there, they may not wake up in time or have the training to know what to do if there’s an emergency. Assisting Hands Home Care provides superior overnight care services to clients in Des Plaines, IL to take the worry out of the overnight hours. If you have a loved one who needs someone to be on-call overnight, we’ll send one of our thoroughly vetted and trained professionals in the evenings; this person will stay until the arrival of a family member or other caregiver in the morning. We help them prepare for bed, stay awake during the overnight hours in case they need assistance, and help them with their morning routines. If a situation arises in the middle of the night, someone is awake and available to respond. The caregiver can stay in the same room as the client or in another room in the home; it depends on the nature of the client’s condition and personal preference. Overnight care services do more than just help people with mobility issues. Seniors who have impaired vision due to glaucoma, cataracts, or other eye diseases may be able to navigate their homes during the day, but they may be unable to see well enough at night to move without hurting themselves. An overnight caregiver will ensure that someone with low vision can move without fear in the middle of the night, as well as monitor recent surgery patients for complications. They’ll make sure all medications are taken according to doctors’ orders and make them as comfortable as possible. 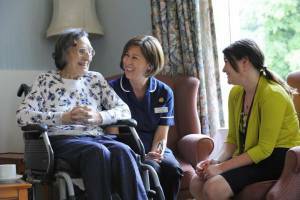 Our aides can also supervise dementia patients to guarantee they don’t wake up and wander away. We’ll help them stay calm and guide them back to bed. Using a skilled, compassionate overnight caregiver from Assisting Hands Home Care will provide much needed peace of mind for both you and your loved one in Des Plaines, IL. You’ll know that someone will be there in the middle of the night to take care of anything that may occur quickly and competently, from changing bed positions to medical emergencies. Call us at (847) 915-6186 to speak to one of our Care Coordinators about our overnight caregiving services.